For more information or to book a speaking engagement, contact us at marketing@marketingabovethenoise.com or (650) 281-4854. For press inquiries, please contact Kim Petty at Cave Henricks Communications, (512) 519-9875, kim@cavehenricks.com To purchase bulk copies of Marketing Above the Noise, contact Jill Friedlander, jill@bibliomotion.com, or 617-934-2427. Podcast: “Using Friction to Improve Your Marketing with Linda Popky” – Gene Hammett interviews Linda on Leaders in the Trenches. “How Great Consultants Can Stand Up and Stand Out” by Linda Popky on Women in Consulting blog. Podcast: Interview of Linda Popky about marketing that matters by Steve Caldwell of Manager Mojo. 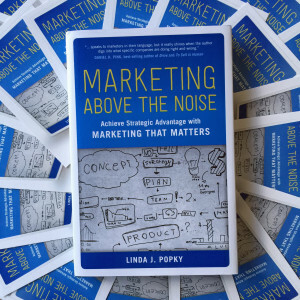 Salim Omar, president of CPA Marketing Genius, interviews Linda Popky, who discusses her book, Marketing Above the Noise. “Fake News Impacts All of Us: Here’s How Content Creators Can Adapt” by Dennis Shiao. Linda Popky talks about Pizzagate. April 29, 2016 Marketing Above the Noise was nominated as the Small Business Book Award in Marketing. 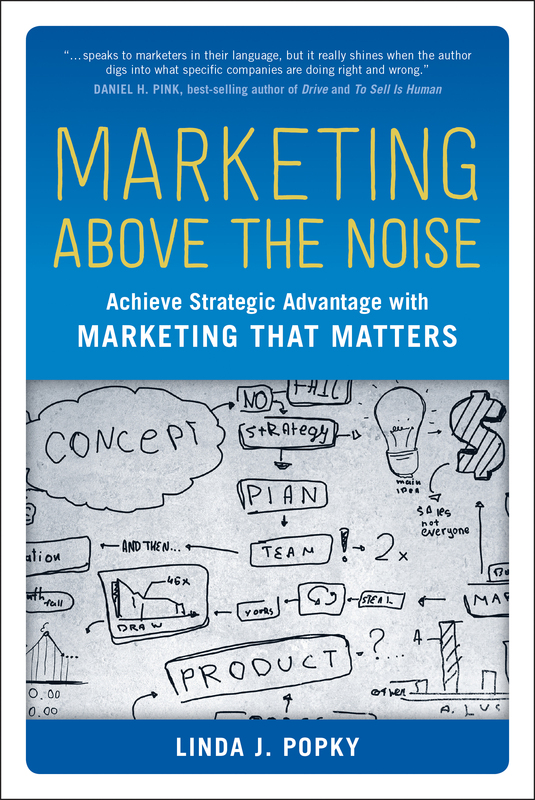 January 15, 2016 – Marketing Above the Noise is a finalist in the Marketing Book of the Year 2016 competition. Vote between Jan 15 and Jan 31! 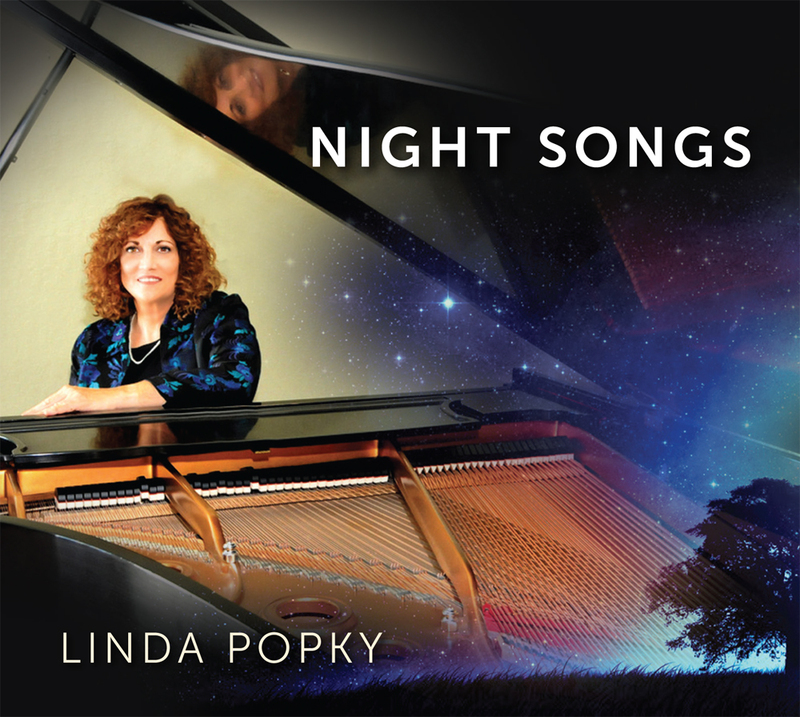 August 7 “Market Above The Noise!” podcast with Linda Popky on Newbie Writers. August 4 “Changing the Conversation: How Independent PR Professionals Can Differentiate Themselves in a Crowded Marketplace” podcast by Linda Popky hosted by PRSA. See related blog post (Aug 14). May 5 “Don’t Let Marketing Tech Sabotage Your Success” on chiefmarketer.com. May 5 “Marketing Above the Noise” book review on Midwest Book Review. May 2015 “Top 10 Advertising Myths” in Strictly Marketing Magazine (May/June issue, pages 21-22). April 28 “Marketing Above the Noise” review on getabstract.com. Read review in Portuguese. 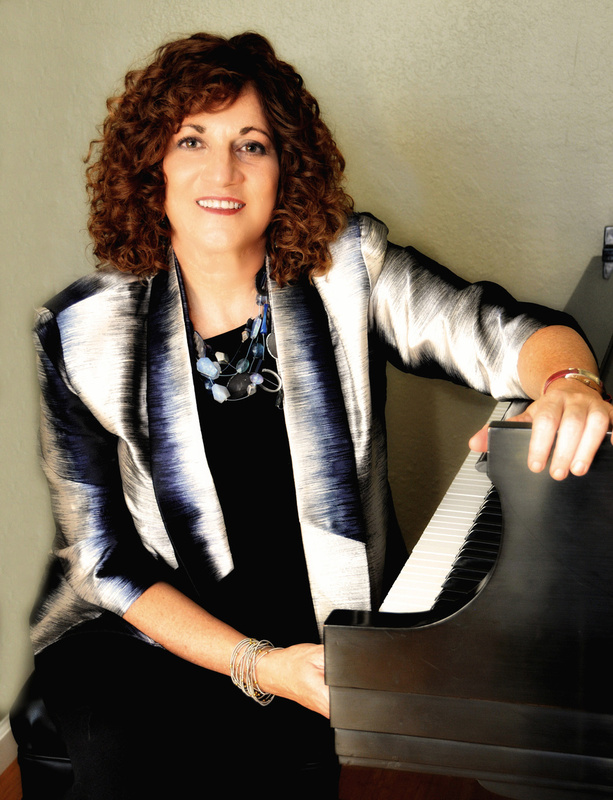 April 24 Interview on “EGG Live!” (Executive Girlfriends’ Group) with host Chicke Fitzgerald – Listen on BlogTalkRadio or iTunes. 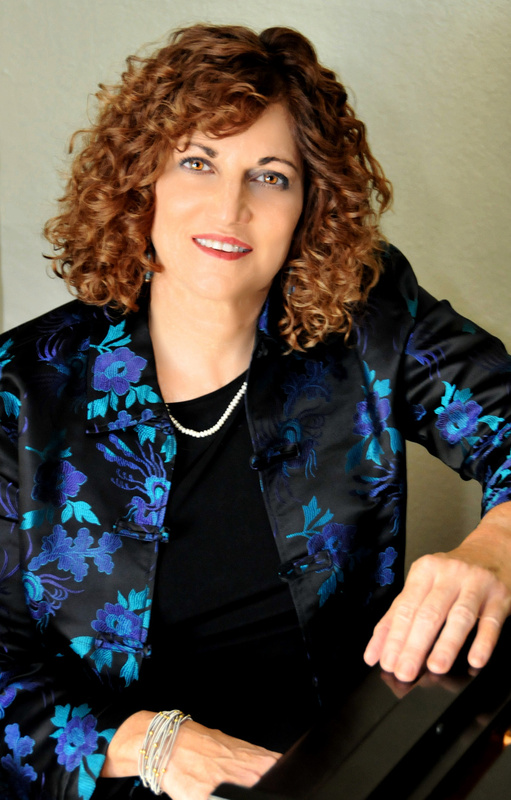 April 13 “Networking Can Help You Get Heard Above the Noise” audio interview by Lisa Platt of Business Networking Made Simple. 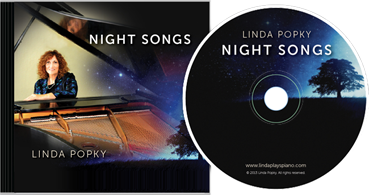 April 8 “Linda Popky: Marketing Above the Noise” audio interview on 33voices. See also: Linda’s profile and a 1-min audioclip. 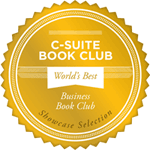 March 25 “Is Social Media Helping or Hurting Your Company?” – American Management Association®‘s Playbook. March 18 “Being Heard in a Chaotic World,” – ChangeThis. Download the article. March 15 “Being Heard: What Successful Consultants Can Do to Get Above the Noise” – Alan Weiss’s Contrarian Consulting Blog. 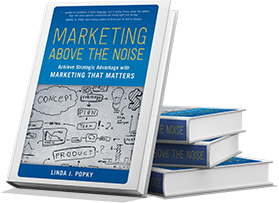 March 4 Linda Popky’s Marketing Above the Noise has joined the C-Suite Book Club. 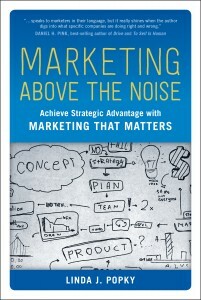 Feb 27 “‘Marketing Above the Noise‘ – 5 reasons to read this book” – by Mike Gospe, author of The Marketing High Ground. 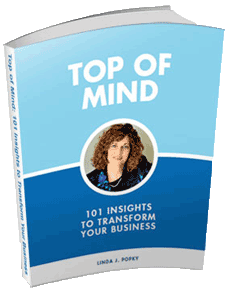 Feb 11 “Why 5% Succeed – Insights with Linda Popky” (video) – Hangout On Air Show with Elaine Starling. Jan 23, 2015 “Spring 2015 Announcements” of Publishers Weekly.